Students at Pequea Elementary School hosted a special guest Thursday when state Rep. Keith Greiner stopped by to read them a Dr. Seuss classic in the school’s library. 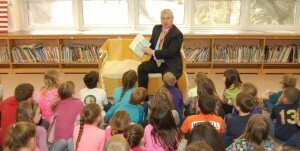 Rep. Greiner represents the 43rd House legislative district, and each year he reads to students in some of the schools in his district as part of the “Read Across the 43rd” program. Pequea second-graders listened intently as Greiner read “Green Eggs and Ham” and talked about his role as a state lawmaker. His visit was originally scheduled to coincide with the “Read Across America” events celebrating the life of Dr. Seuss (Theodore Seuss Geisel), the children’s author who was born March 2, 1904. But snow delayed his visit. After the reading, students told Greiner about the green eggs – and other unusual foods – they had eaten.